From left: Darren Siwes Northie Kwin and Jingli Kwin © Darren Siwes. Courtesy of the artist and GAGPROJECTS/Greenaway Art Gallery, Adelaide. Licensed by Viscopy, Sydney. Darren Siwes reworks colonial narratives and cultural stereotypes by treating the body as a site of political tension. In the 2013 series Mulaga Gudjerie (Man Woman) Siwes casts an Aboriginal couple as sovereign heads of state. 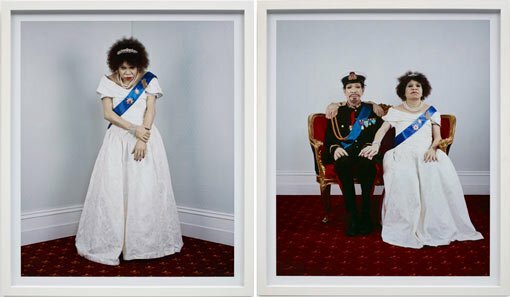 Dressed in imitation regalia and arranged in poses that subtly challenge the conventions of official portraiture, Siwes’ subjects upend the hierarchical structure of the monarchy. Northie Kwin and Jingli Kwin (meaning Northy Queen and Naughty Queen in Dalabon dialect respectively) reveal subtle imperfections despite the stately power these scenes project. The white body paint does not cover the figures completely, while the gold paint on the chair is peeling. Siwes does not offer a straight or seamless impersonation but investigates the mutability of historical circumstance. List words that express your immediate response to these works. Who are the people pictured? How do they feel? Are they comfortable? Are they dressed in their usual clothes? Describe their expression and where they are looking. Think about how makeup, costume, props and pose provide information about their projected identity and position. Is this identity a truthful one? Explain your answer. Research and refer to portraits of royalty and other heads of state over time and identify the conventions of such official portraiture. How has this genre been utilised to assert and underpin power and status throughout history? Identify the ways in which Siwes’ portraits differ from conventional portraits of royalty. Do you think Siwes’ work challenges or reinforces these conventions? Support your position with evidence from the images. Siwes sourced, designed and constructed every element of the interior in which his subjects pose. In small groups, stage a theatrical photograph that uses costume, props, gesture and setting to establish identity. Experiment with posing your subject in different ways. Note how posture can embody character and status.